It is clear that the System E construct for Passover, if it was not actually invented jointly by Irenaeus and Victor, was brought to the forefront and advocated by them. Notice that the original regions of this new view were Italy and Gaul, where Victor and Irenaeus were head bishops. The practice is then assumed to have spread throughout other countries, with the implication that it came from Italy and Gaul, where it was originally observed. That Irenaeus was a major contributor is further demonstrated by his influence over Victor in the events that followed the series of conferences we have mentioned above. The bishop of Rome had already demonstrated his authority in the West by his ability to bring together the other western assemblies into doctrinal agreement with Roman leadership. This influence, in turn, gave him a great sense of power. As a result, Victor moved to eliminate his opposition. Based upon the agreements he had reached with the other western assemblies, Victor issued a decree that all Christians must keep the Passover according to the Roman assembly system. At this point Irenaeus stepped in. Due to the request of Irenaeus and the others, Victor recanted.12 The special mention of Irenaeus, who “had recommended” the new view, demonstrates that he had important influence over Victor. Victor saw his chastise­ment as instruction from one who had been important in the development of the System E construct. It is in these letters that we first piece together the ideas forming the System E Passover. The writings of Irenaeus reflect the earliest Christian interpretation which held to the prescript that Moses had commanded the Passover lamb to be killed prior to the setting of the sun (i.e., at the end of the 14th day), being also the same time that the messiah died. Therefore, he interprets the day of the messiah’s death along Hasidic lines, while fully acknowledging that the messiah ate the Passover the night before (at the beginning of the 14th day). How the advocates of System E dealt with the dilemma of two Passover suppers (one eaten by the messiah on the 14th and one by the Jewish leaders on the 15th) shall be discussed as we proceed. An important convert to System E was Clement of Alexandria (writing c.193–212 C.E.). When the bishops of Alexandria came over to the System E side, it tipped the scale strongly in favor of Rome. In his own work on the Passover, Clement sets down Irenaeus’ account of the Passover debate, thereby showing that Irenaeus had important influence upon Clement.18 Bringing the Alexandrian Christians over to the Roman side would prove to be an important political victory. Clement was the product of an Alexandrian school taught by a man named Pantaenus. This Greek Stoic philosophy was also strong among the large Pharisaic community of Jews living in Alexandria, for the Pharisees were “a sect having points of resemblance to that which the Greeks call the Stoic school.”22 In this regard, Pantaenus and the Jews held common ground. Though this book is now lost, its very title reflects his anti-Jewish sentiment. Clement also wrote an important book discussing the Passover. This evidence proves that Clement of Alexandria composed his own work with regard to the Passover based upon his studies of arguments given by Irenaeus and Melito. Clement favored the views of Irenaeus and opposed the Quartodeciman views of Melito. 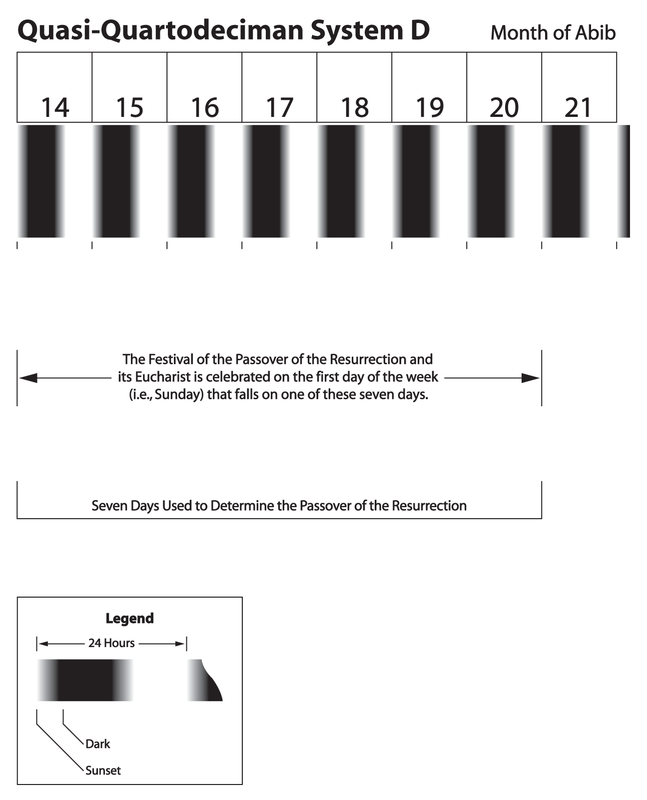 The coupling of the omer wave offering on the first day of the week with the resurrection of the messiah, of course, reflects his intent on celebrating the Passover of the resurrection. 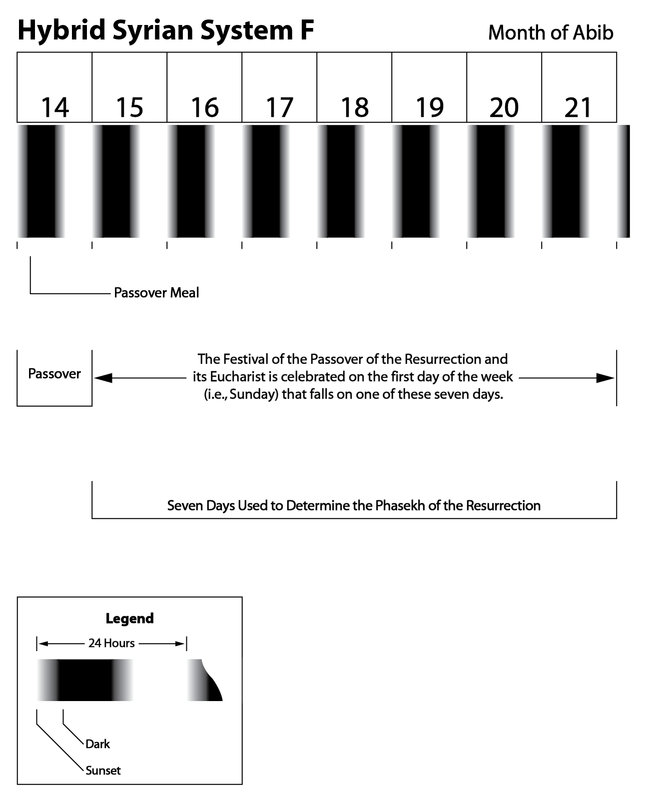 What is interesting about Clement of Alexandria’s work on the Passover is that he also demonstrates the transition period from System D to System E.
This shows Clement of Alexandria’s belief that the Passover supper of the messiah was held on the day before the legal Passover of the Jews. No doubt the Egyptian work attributed to the Gospel of the Hebrews, as indirectly quoted by Jerome (c.348-420 C.E. ), comes from the time of Pantaenus and Clement. 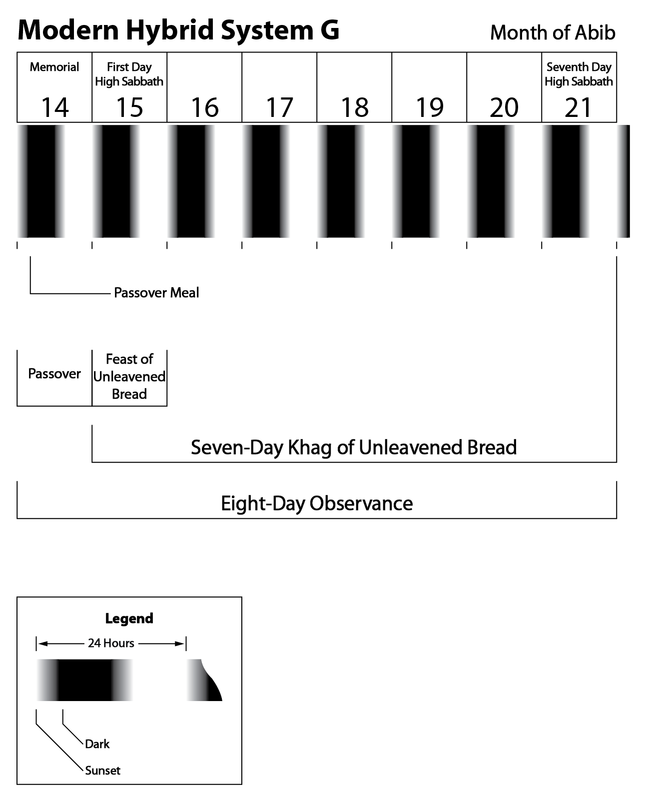 It reads, “The eight days of the Passover, on which the messiah the son of the deity rose.”37 This statement reflects the transition from the earlier Quartodeciman view of a seven-day Festival of Unleavened Bread to the Pharisaic eight days. Origen accepted the Pharisaic interpretation for the week of Passover. In his work On Phasekh, he recounts the commands given in Exodus, 12:3-5, where the Israelites are told to take the lamb on the 10th day of the moon and keep it until the 14th for sacrificing. The evidence demonstrates that an important movement toward the Christian Hasidic system got under way around 165 C.E. and blossomed in the days of Irenaeus, bishop of Gaul, and Victor, bishop of Rome, and their important proclamation of 196 C.E. 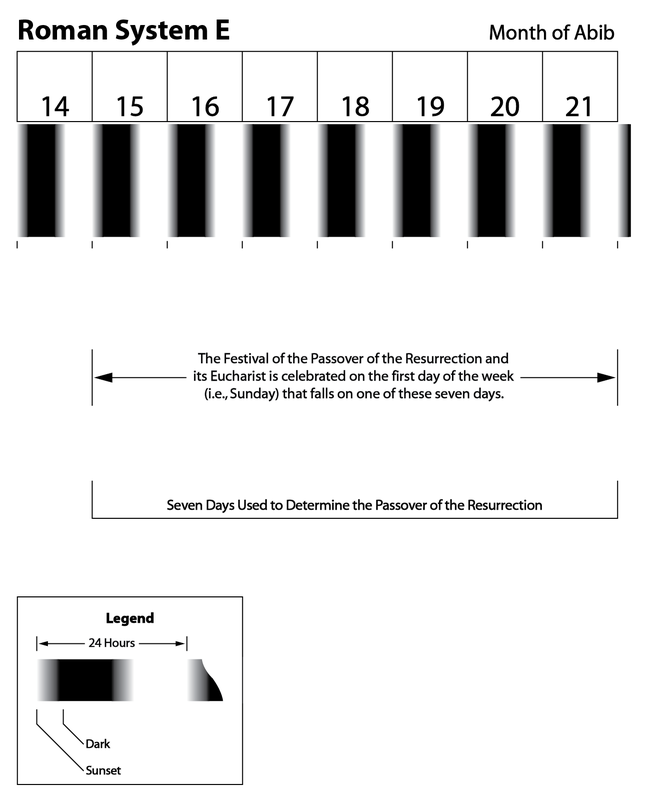 The result was System E, which follows the Hasidic System of observing the seven days of Unleavened Bread, i.e., from the beginning of the 15th until the end of the 21st day of the first month of the scriptural calendar. Its advocates did not allow that the 14th day of that month was the legal Passover supper. Instead, they interpreted the data so that the messiah and his disciples kept the Passover sacrifice and supper on the night of the 14th as a pre-Passover enacted parable. The “Last Supper,” therefore, was merely a foretype of the future Passover that was to be kept only on the first day of the week when it fell on any of the days extending from the 15th to 21st of Abib. This wraps up the discussion of the Roman influence which ultimately proved to be the dominant force among many of the Christian assemblies. In our next post, we will investigate the mechanics of the Christian Hasidic construct as represented by the Roman assembly System E along with another form, the Syrian hybrid System F.
Finally, within this discussion, we will address a popular construct that has evolved from these two systems that is being practiced by many present-day followers of Yahweh and their respective assemblies, System G.
So, be on the lookout for 27. Passover – Evolution to Today I coming your way soon! 1 Eusebius, H.E., 5:4:1, 5:23:4, 5:24:11; Jerome, Lives, 35. 2 For more details regarding the life of Irenaeus, and his education in Rome before he migrated to Gaul, see FSDY, App. G, pp. 453ff. 3 Eusebius, H.E., 5:4:1, 5:23:4, 5:24:9-18; Jerome, Lives, 35. 4 Eusebius, H.E., 5:23:1-4, 5:24:11. 5 Irenaeus, frag. 7; Ps.-Justin, 115. 10 Eusebius, H.E., 5:24:9; Socrates Schol., 5:22. 13 Patrol., 1, p. 294. 14 E.g., EEC, p. 145, #28, “Written between 180 and 185.” Sections were probably composed in the first years of Victor, when he was co-bishop with Eleutherus (189–193 C.E.). 15 Irenaeus, Ag. Her., 2:22:3. 16 Irenaeus, Ag. Her., 4:10:1. 18 Clement, Pas., frag. 25. 23 Eusebius, H.E., 5:11, 6:13. 27 Butterworth, Clement, p. xii. 28 Eusebius, H.E., 6:13:3, cf., 6:8:7, 6:11, the year Antoninus Caracalla succeeded Severus (i.e., 211 C.E. ), at the time when Alexander became bishop of Jerusalem. 31 Clement, Pas., frag. 28. 32 The Egyptians and Romans reckoned a midnight-to-midnight day (Pliny, 2:79). 33 Clement, Pas., frag. 28. 35 That the supper and feet washing of John, 13:1-12, actually occurred on the night of the 13th of Abib can be ascertained when the chronology of the messiah’s last several days before his death is correctly layed out. 36 JTS (NS), 24, p. 77. 39 Daly, Origen, p. 2. 40 Daly, Origen, p. 3. 42 Origen, Pas., 25, cf., 16, 17, 20. 45 Origen, Com. John, 32. 46 As stated in John, 13:1-2. This entry was posted on 02/11/2013, 11:54 am and is filed under Calendar, Easter, Feast Days, High Sabbaths, Holy Days, Passover, Quartodecimans, Religion, Scriptural Calendar, Tekufa, Tekufah, Tequphah, Tequphath, Unleavened Bread, Vernal Equinox, Yahweh. You can follow any responses to this entry through RSS 2.0. You can leave a response, or trackback from your own site.